I love all things Italian; the architecture, art, culture, fashion, the people and their philosophy of “la dolce vita”–but most of all the food. When it comes to cooking, Italians know their way around a cucina. If I could eat only one type of cuisine for the rest of my life, I would choose Italian hands down. Heck, I even married my second generation Sicilian sweetheart eighteen years ago. Despite his preference for my culinary skills, he can still make a mean pasta Bolognese in a pinch. My husband’s Grandmother, Venera, was pregnant with his father when she made the long, arduous journey from her Italian homeland to America in the steerage of a ship in 1927. Traveling with her were her three young children, all on their way to reunite with her husband Frank who awaited their arrival in New York. Photographs of Venera portray an austere woman who had endured hardship. Often dressed in floral prints, her dark hair pulled tightly back into a bun, she possessed that sullen, stoic look one often finds in the women of her generation where hard work and daily drudgery left little to warrant a smile. But she was a force in the kitchen where feeding her family was more than a provision of daily nourishment–it was her expression of love. As a little boy, my husband has faint memories of his Italian grandmother; flinging open the door of his grandparent’s three-story house in Queens to be greeted by the familiar and comforting aroma of her cooking. There were pots of simmering bolognese on the stove, along with the heady, pervasive smell of garlic, and homemade meatballs. He marveled at the way she cooked without written recipes, relying on the time-honored traditions she had learned in the “old country.” She approached each dish instinctively; a pinch of this, a handful of that–her large form moving deliberately between the stove and the table amid a stream of unintelligible Italian to his ears. There was a large table in the center of the kitchen that to his recollection was always filled with platters of food. It was a natural gathering place for family and friends who would come and go throughout the day, always welcome to partake of the seemingly endless stream of dishes offered. No one went away hungry. Although she has been gone for many years now, her kitchen prowess is something I aspire to. In summer when Italian Genovese Basil grows like a weed, I MUST make fresh pesto. This fragrant sauce can be slathered on almost any savory dish, infusing it with an extra layer of flavor that instantly conjures Italy. I whip up large batches at a time, using some immediately and freezing the rest to remind me of warm weather’s bounty when winter’s chill is in the air. I used to buy my pesto at the store until I realized how simple, rewarding, and inexpensive it is to make my own. I offer you here my classic recipe for pesto. My method of preparation is largely by feel and taste, rather than precise measure. I urge you use it as is or adjust the ingredients to suit your own taste. 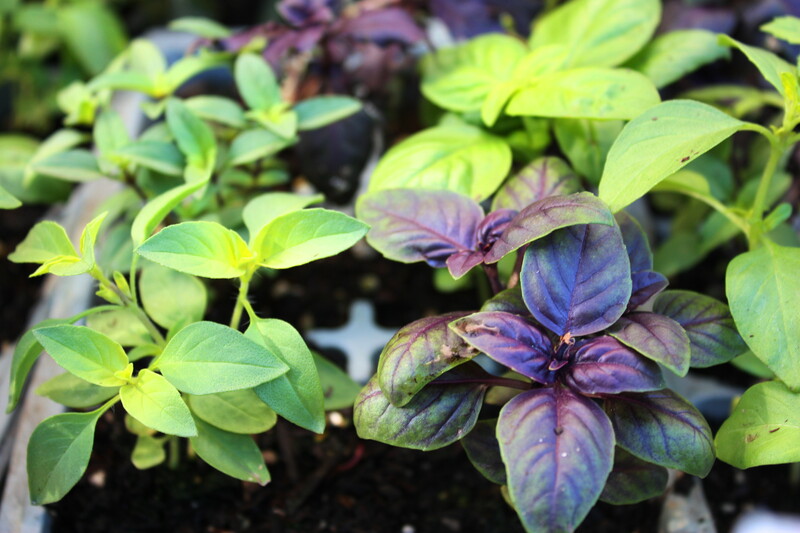 You can also experiment by substituting other greens for some or all of the basil, to create different highlights in flavor. Try lemon basil, spicy-peppery arugula, or kale. Lastly, I’ve included recipes for heirloom tomato salad with Burrata and fresh pesto, a staple on our family table during the summer months, as well as Basil-Tomato-Mozzarella stuffed Chicken Breasts courtesy of Chef Suzanne Griffin from Cooking By The Bay. I’d like to think Venera would approve. 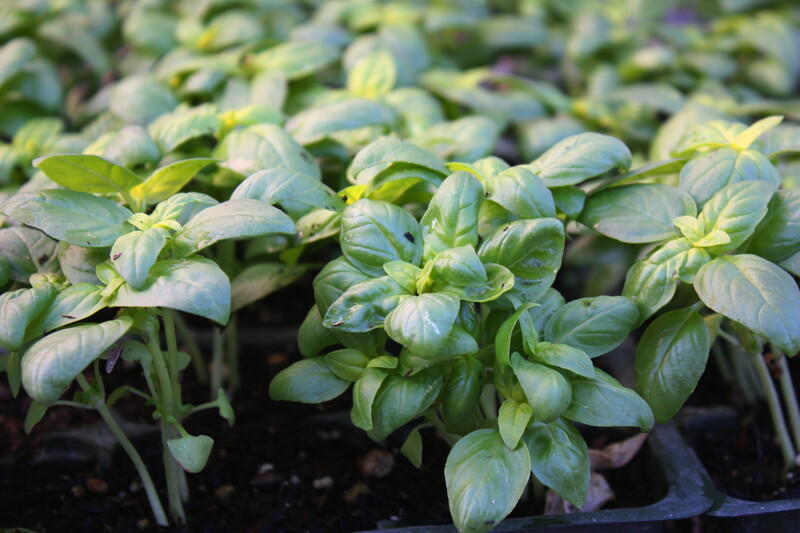 Gently rinse basil with water and separate the leaves, discarding the stems. Pack the leaves in the bowl of a food processor with grated cheese, garlic, and pine nuts. Pulse until finely chopped. With processor running, slowly drizzle in olive oil–pausing while it incorporates–until a smooth paste forms. You may refrigerate some of the pesto in an air tight container for use within three days. Spoon the rest into several single serving ziplock. Press out the air and freeze. 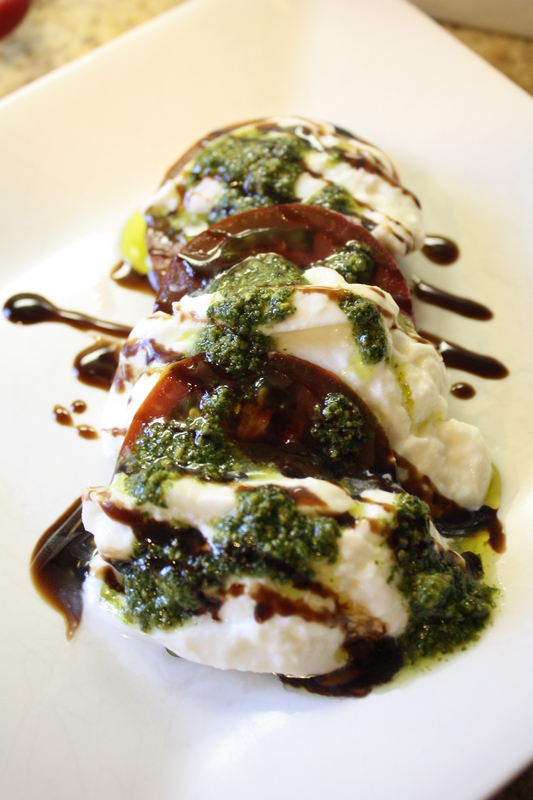 *Burrata is a cream filled fresh mozzarella cheese that is found in the cheese section of many specialty stores. Trader Joes carries it as well! Cut tomatoes in thick slices. Thinly slice Burrata and layer between tomatoes on a large platter or individual serving plates. In a small glass, put a tablespoon of pesto and add a little olive oil, mixing with a spoon so it will pour. Drizzle over tomatoes and cheese, followed by a drizzle of balsamic vinegar. Finish with a grinding of pepper if you like. Zest the lemon and set aside. Cut the pith away from the zested lemon and thinly slice. Set aside. Place chicken cutlets, one at a time, between two pieces of plastic wrap, and pound to ¼” thickness. Lay 3 tomato slice on each cutlet, top with basil, then mozzarella, and lemon slices. Working from one of the short ends, roll the cutlets, tucking in as you go. Secure with toothpicks. In a food processor, blend the panko, parmesan, basil, red pepper flakes, garlic and lemon zest until fully combined. Place panko mixture in one bowl. Place flour and eggs in two separate bowls. Dredge each of the rolled chicken cutlets in the flour, then the egg, then the panko mixture. Place cutlets in a baking dish coated with olive oil, and brush each roll with additional olive oil (about 2 teaspoons each). Bake until lightly browned and cooked through to 165°, about 45-55 minutes. I just bought a second basil plant with the idea of making pesto. My mouth is watering after reading these recipes! Enjoy Madeline! Thanks so much for reading and stay tuned each week for more great farm to table. There is also an excellent recipe for making pesto in the vegetarian cookbook classic, THE ENCHANTED BROCCOLI FOREST by Mollie Katzen (1982). Mollie makes a special note of saying “no stems” and I think this is the key to creamy pesto. It takes a few extra minutes to get all of the stems off the basil leaves, but it makes a big difference in the quality of the final sauce. Thank you for your comments and for reading Patti. I agree the “no stems” rule is key to creating perfect pesto!